The Laboratory of Theoretical Biochemistry (LBT, or Laboratoire de Biochimie Théorique, CNRS UPR9080) is one of five laboratories within the Institut de Biologie Physico-Chimique (IBPC) in Paris. The LBT belongs to the French National Scientific Research Centre (CNRS) through its Institute of Chemistry, and is associated with Paris Diderot University. The laboratory was created at the IBPC in 1958. Our field is theoretical and computational biochemistry, at the interface between biology, chemistry, physics, and computing. The director of the LBT is Dr. Marc Baaden, the adjunct director is Dr. Chantal Prévost. Our strategic objectives are twofold: invent simulation algorithms to reproduce and predict physical properties of biomolecules either in vitro or in the cell, and understand the molecular or conformational factors responsible for the biology of living systems and diseases. The equilibrium between the two is a key feature of the LBT. 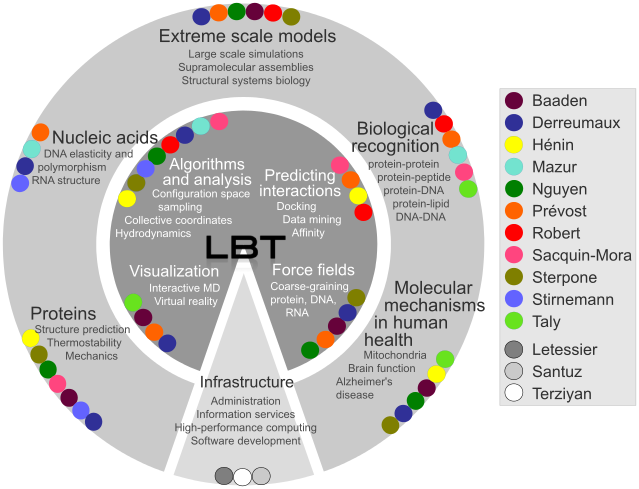 The LBT is organized as a team of independent researchers with complementary interests and domains of expertise, both in methods development and in biophysical, biochemical, and biomedical applications. Advances in each of these domains emerge from the association of different groupings of researchers around individual projects.